How compatible are Libra women and Taurus men mentally, emotionally and sexually? The airy Libra woman and the earthy Taurus man connect on many levels. 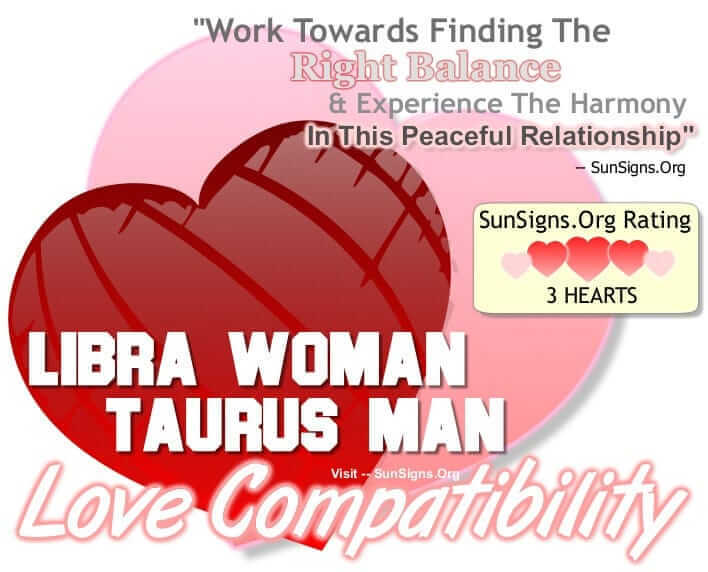 Both the Libra woman and Taurus man appreciate harmony in a relationship and try to avoid drama as much as possible. But her indecisive behavior is irritating to his steadfast nature, and these two sun signs will have to work to find a balance in love. The attraction between the female scale and male bull begins with their conversations. The Libra woman is very analytical and he appreciates how thorough she is in her thought process. The Taurus man is rational and stable, and she is grateful for his ability to make concrete decisions. Libra women have trouble with quick choices, which can be annoying to him, but if she allows him the final word than they grow more comfortable with each other. And both the Libra woman Taurus man enjoy aesthetically pleasing things in life, whether it’s art, music, or their possessions. The Libra female can be a bit lavish in her tastes, which might irritate him at first, but he agrees with her selections. And he can be quite stubborn in his preferences, which will drive her crazy after a time. But if they can learn to bring her mediation skills together with his practicality, the Libra woman and Taurus man will both decide to take the next step in their relationship. And this Libra woman Taurus man couple will shine in the bedroom. The Libra woman is all about pleasing her lover, and the Taurus male is a rock from which they can build their sexual union. They both enjoy the courtship and will take turns with affectionate gestures and romantic advances. Libra women are fun and charming, and use their flirty nature between the sheets to tickle the fancies of their partner. Taurus men, in turn, bring their physical stamina to the table and provide a powerful climax. The only potential problem between these two signs is who will take the lead. If the Libra woman has some ideas she wants to try he will oblige her, as long as it doesn’t interfere with their momentum. But because she is so concerned with getting everything right, her inability to act may get in the way of their natural passion. The Taurus man may have to take charge to keep things rolling smoothly. This is true of their relationship outside the bedroom as well. The Libra woman relies on her thoughtful disposition while the Taurus man relies on his practical nature, which can be complementary or opposite depending on the situation. When they are on the same page everything is wonderful. If they’re not, the Taurus can unleash his outrageous temper surprising his Libra mate. She of course will be more interested in compromising while his stubborn personality won’t budge. But the Libra female may be able to use her powers of persuasion to get him thinking in her direction, even if he ultimately makes the final decision. The Libra woman Taurus man couple both enjoy a cozy home environment and have no problem spending an evening in. This is good, for the Taurus can be a bit possessive of his partner. And although she enjoys going to parties, something he may be jealous of at times, he knows that she is committed to only him. And when he returns that same loyalty, these two are together for life. Libra is a cardinal air sign whereas Taurus is a fixed earth sign, the Libra woman Taurus man compatibility gets a THREE Hearts rating. It will take work to find that common ground but the Libra woman Taurus man are willing to put in the effort. And if they can achieve that kind of balance, their love compatibility will be just too great!